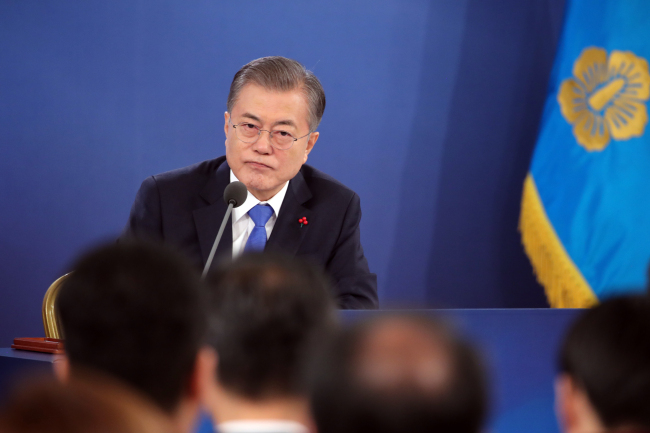 South Korean President Moon Jae-in on Thursday stressed the need for North Korea to take more concrete and faster denuclearization steps while also highlighting the importance of corresponding measures by the international community to further accelerate the denuclearization process. "I believe North Korea needs to take practical denuclearization steps more boldly if it wishes to resolve the issue of international sanctions because the issue of international sanctions depends on the speed of North Korea's denuclearization process," the president told a press conference held at his office Cheong Wa Dae. "I believe corresponding measures too must be considered to further promote North Korea's denuclearization process," Moon said. Moon's remarks follow months of apparent debates between the United States and North Korea over who should do what first. Pyongyang is said to be demanding corresponding measures for the denuclearization steps it has taken so far, while Washington says the North needs to do more. Moon said such a gap may stem from years of distrust and hostility. "I think both sides are aware. North Korea knows it needs to take more concrete denuclearization steps in the end to remove international sanctions, and the US too sees the need for corresponding measures to encourage the North's denuclearization,"
"However, they are asking the other side to act first because they cannot trust each other. I believe that is why the second US-North Korea summit has been delayed until now," he added. US President Donald Trump and North Korean leader Kim Jong-un met in Singapore in June. Moon noted the second US-North Korea summit may be imminent, saying Kim's trip to China this week could be an indication of it. "I believe Chairman Kim's China visit is a sign that the second North Korea-US summit is not far away. China has continued to play a positive role in the process of inter-Korean dialogue, as well as US-North Korea talks," he said. Moon dismissed concerns that North Korea and the US might be quarreling over what "complete denuclearization" should entail, saying the North Korean leader fully understands and agrees with the definition of complete denuclearization used by Washington and the rest of the international community. "Kim Jong-un has clearly stated to the leaders of each country that he has met, including myself, President Trump, President Xi Jinping, President (Vladimir) Putin, that there is no difference between the complete denuclearization he is talking about and the complete denuclearization the international community demands," the president told the nationally televised press conference. He also expressed hope for Kim's visit to South Korea in the near future, possibly following his second summit with the US president. "I believe (the Seoul visit) will be realized since Chairman Kim personally promised and announced it. But because it is linked to the second North Korea-US summit, I believe Chairman Kim's reciprocal visit may be pushed for more smoothly after the second North Korea-US summit takes place first," he said.